Through vivid stories of the experiences of their patients (both adults and children), Drs. Hallowell and Ratey show the varied forms ADD takes -- from the hyperactive search for high stimulation to the floating inattention of daydreaming -- and the transforming impact of precise diagnosis and treatment. The New York Times Book Review A very readable, highly informative and helpful book. Judith L. Rapoport, M.D. Chief, Child Psychiatry Branch, National Institute of Mental Health, author of The Boy Who Couldn't Stop Washing A wonderfully readable and, most important, practical and useful book on ADD. Peter D. Kramer, M.D. 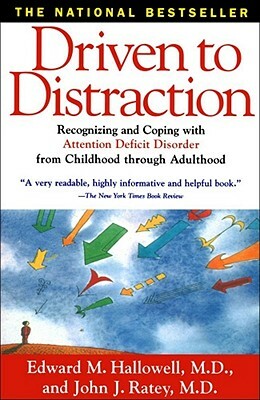 author of Listening to Prozac Conversational in tone, encyclopedic in content, and, best of all, utterly convincing because of its grounding in clinical experience, Driven to Distraction should make Attention Deficit Disorder comprehensible even to the most distractible reader. Sandra Freed Thomas, R.N. former president of CH.A.D.D. (Children and Adults with Attention Deficit Disorder) This rich resource has it all -- education, family perspectives, diagnosis and treatment, subtypes -- but throughout there is a joyful and pervading sense of hope. One cannot read this book without developing a great sense of how it feels to live with ADD -- to compensate for, even to benefit from, its characteristics. Priscilla L. Vail author of Smart Kids with School Problems The highest order of helping and healing glows through this book. Informative, compassionate, practical, and -- yes -- funny, it draws the reader in as it throws confusion out. Jane M. Healy, Ph.D. author of Endangered Lives This is an important and much-needed book! Wise, practical, and reassuring....A must-read for anyone who knows, treats, or is an "underachiever" -- in school or in life.